Manage your TruCash account on the go. Available as a fully-branded solution, truTap V2.0™ helps manage your TruCash Prepaid Card account on the go, quickly and easily. Verify the balance of your prepaid card, view detailed transaction information, and other features and functions that reflects the individual client programs. Available for both Android and IOS phones. Manage your card account, in the palm of your hands with truTap™ V2.0. No more guessing your card balance, you can check your available balance quickly and easily from anywhere, in real-time. View your transaction history at a glance in seconds. With truTap v2.0 account management is just a tap away. Unlike some mobile apps, truTap V2.0® is not carrier dependent and works on most Android and IOS phones. The truTap mobile app is designed for use with TruCash branded Prepaid cards. truTap™ v2.0 has been upgraded! Version 2.0 comes with complete multi-currency support, available in both USD and CAD versions to better suit your needs. 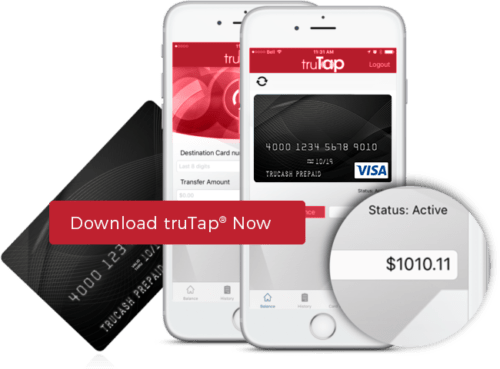 Please note: truTap USD is available for cardholders that have a card issued in USD Funds, while truTap CAD is available for cardholders that have a card issued in CAD funds. Protecting your data and funds is our number one priority. If your card is lost or stolen, you can use our unique truTap ‘suspend’ function to protect your personal information. When you add your cards, or send money with truTap, you are backed by bank-grade encryption.